The Adios was traditionally a post-Hambletonian affair, refocusing upon the glamour-boy pacers after the severe concentration of glamour-boy trotters. In the new millennium, the Adios is part of August’s overture of harness highlights and unlike its old place on the stakes calendar, the Adios absentees are usually the best of the division. The 2014 Adios presents a strict, second-tier cast in the soph-colt pacing division, with the two giants, JK Endofanera and Hes Watching, passing. Also absent are Always B Miki, Doo Wop Hanover, Western Vintage, Lyonssomewhere, Tellitlikeitis and Sometimes Said, leaving the elims looking a lot like the ad hoc consolation for the Meadowlands Pace. It is no wonder that the morning-line favorite is McWicked. The good news is that all three Adios elims may be good betting races, maybe better than the July 26 final. So we will dig into them in this blog, looking for some generous returns on our plays. Older pacers and trotters will tangle in Ohio and Ontario with the Battle of Lake Erie at Northfield and the Maple Leaf Trot at Mohawk. Frosh class is displayed at Yonkers in the Lawrence Sheppard Final and the first leg of the Ima Lula features four-year-old mare trotters at the Meadowlands. Canadian Breeders Championships (CBC) for pacers at Mohawk are covered below, while those for trotters and the Reynolds is covered in our spin-off blog, the Hambletonian Trail. Check it out by clicking here. Overnight action culminates in our horses-to-watch list (H2W), where our suggested contenders have been mighty across-the-board plays, with many exorbitant place and show prices. Saturday night, July 19, the $125,000 Lawrence B. Sheppard Pace Final for two-year-old colt-and-gelding pacers highlights Yonkers’ program. Leading the field of eight are the elim winners In the Arsenal and Cartoon Daddy. They are joined by Byby Landon, Mystical Pacer, Rock N Roll World, Lone Survivor, Perfect Eagle and Parklane Eagle. Mystical Pacer draws our interest from a tough outside trip in his elim that still got him third. “Arsenal” beat Byby Landon on getting the wood in an early duel. “Mystical” has the goods to take this event where only two colts are not maidens (Arsenal and “Cartoon”). He should be a decent price, one you may pump up in exactas by using Byby Landon (how the fans hate the 8 hole) and Parklane Eagle (from the productive sire of froshes, Somebeachsomewhere). The $603,000 Maple Leaf Trot Final defies nine older trotters to go faster than Sebastian K. That is the end of the conversation. This season, Ake Svanstedt’s monster trotter has devoured the division and won faster than any trotter in the history of the sport. He has beaten the likes of the “Maple” field, proving Mohawk was not a problem (the elim was his first race in Canada). So now what do handicappers do? Perhaps some thoughts from a trainer may help punters lean away from Ake’s stallion. Rod Hughes, whose horses have won the Maple three times, said he doesn’t think “K” has been “in deep enough” to be considered a lock in any race. Hughes told local journalists that K’s racing without shoes may hamper his winning two weeks in a row. Hughes likes Market Share and Mister Herbie better than K this week. “Herbie” won this race in 2012 in 1:50.4, faster than K went last week on this surface. Hughes said it is difficult to go faster than Herbie went winning unless it is a very warm night. Why not take Hughes’ analysis? 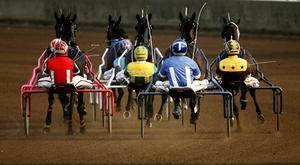 After all, his trotter, San Pail, when he was at his best, beat big European trotters in Canada. Plus, we have been on the side of Herbie many times; he is a top trotter and he is on his home field. So let’s look for the upset, not with Market Share, with Herbie. Here is the field for the $603,000 Maple Leaf Trot in post position order: Sebastian K, Market Share, Intimidate, Archangel, Wishing Stone, Mister Herbie, Creatine, Undercover Strike, Flanagan Memory, Modern Family. The 48th edition of the $600,000 (est.) Delvin Miller Adios Pace for the Orchids is the focus of a great stakes program on July 26 and an end to a great Grand Circuit week of racing at the Meadows; great for bettors. We will be posting various wagering suggestions through the week on social media sites. Meanwhile, July 19, three Adios elimination divisions race to determine the field for the traditional classic. Each Adios elim is worth $50,000 and six colts start in each. In the first elim we are going to go with Bushwacker, who was fourth in the “Pace” consolation and who offers a price against the two Ron Burke probable public choices. In the second elim, Lets Drink On It finally has a shot to win now that he steps down into the second tier of the division’s stakes group. In the last elim, McWicked will be on a tear to take this wire to wire as a prohibitive favorite. If he has to duel with Stevensville or At Press Time, then Brioni, third in the Pace consolation last week, could take him down. He certainly should be included in any McWicked exotics you choose. This year, “Battle” night at Northfield carries total purses of $554,500. The 15-race program boasts an impressive undercard, featuring nine $40,000 divisions of Ohio Sires Stakes for two- and three-year-old colt pacers and trotters. Foiled Again has drawn post 7 in July 19’s $150,000 Battle of Lake Erie. Of course, he has been named the 3-1 morning-line favorite. Foiled Again makes his sixth appearance in the event and he is aiming to become the first horse in Northfield Park history to win this event three times. Ron Burke, who also sends out Clear Vision, trains Foiled Again. Also among the battlers are Night Pro, Beach Memories, Bolt The Duer, Fool Me Once, Twilight Bonfire and Apprentice Hanover. In thick but getting the rail and on a skein, is Night Pro. He is an Indiana Sires Stakes champ coming into the Battle, against the toughest foes he has ever faced, looking for his seventh-straight win. Apprentice Hanover will be more ignored than necessary because he leaves from post 8. His morning line is 10-1 compared to Night Pro’s 4-1. That’s too much just for being on the outside, especially with too much speed on top. Apprentice Hanover should offer a better chance than his price and these two could be the last two standing at the wire for the upset exacta. A lone division kicks off the Ima Lula series on Friday night at the Meadowlands, compiled of six four-year-old mares, two of which entering off of a showdown with Bee A Magician in the Miss Versatility. One of them is Perfect Alliance, who debuted off of a month layoff last week. She finished seventh and adds lasix for this outing. The other being Handover Belle, the more interesting of the two. For six digits in each division, soph-colt-and-filly pacers bred in Ontario race for the CBC championships. The colts are the first to contest, with 2013 Metro winner Boomboom Ballykeel coming in off of a victory in the elimination. Yet, favored in that elim was Victor Bayama, who took an off-the-pace approach and finished third. When he debuted in late June, he won easily by 3 lengths in the Ontario Sires Stakes (ONSS) at 6-1. From post 10, he has the speed to be put into the mix, which seems to be the best approach in this race as an off-the-pace effort might include a barrage of traffic. Lady Shadow, who will be heavily bet off of a 1:49.1 victory in her elim, highlights the filly final. With a strong on-the-lead type in the field, the only way to beat her would be with a stalker. Another elimination winner, My Secret Belle, fits the condition perfectly. She seems to be driven similarly in stakes races, riding the cones to victory in an ONSS division and doing so in her elimination as the favorite. With Joe Hudon Jr. driving, that will likely inflate her value as we look for her to draft to victory. An outside contender, Nefertiti Bluechip may be able to topple thm all. “Nefertiti” was a sharp third in her elimination at 32-1 and post 9 should be a plus in the stretch since she could stay out of trouble and wallow by speed retarding in the stretch.